What is a landing page and why do you need one? Are you struggling to convert interested readers into enquiries and paying customers? A landing page could help. So let me ask you this. Do you ever find yourself in a situation where you are so near yet so far with your marketing communications? You sweat blood writing persuasive messages to entice your readers to take action. What’s more your analytics tell you your messaging is hitting the mark. But although your communications generate plenty of interest, they fail to convert into enquiries. So what exactly is it that’s stopping your readers from following through on their interest and taking your desired action? It could be once you’ve gained the interest of your reader, you confuse them by sending them to a webpage entirely unconnected to your marketing campaign. By this, I mean a home or service page. It’s a bit like following a recipe. You visit a supermarket for one vital ingredient, only to find you have no idea where to find said ingredient. You wander up and down the aisles and feel increasingly lost and confused. In the end, you give up. The good news is, a dedicated landing page can help solve your problem. A landing page is a web page created specifically for a marketing campaign. Its content mirrors the offer that directed the visitor to it. And its sole purpose is to guide the visitor to take action. Where do landing pages sit? Landing pages sit on your website, but you do not connect them to your website’s navigation. Because of this, you reduce the likelihood of visitors getting distracted. Landing pages form part of your marketing workflow. By this I mean they form part of a sequence of processes that make it easy for a prospective customer to move their enquiry through initial interest through to completion. Whatever your marketing campaign, be it an email, newsletter or even an AdWords campaign, you’ll have an end goal in mind. Keep it focused. Mirror the offer that brought the reader to the page. Keep your copy clear and concise. You don’t want the reader to think; you just want it to do. Answer the question what’s in it for me if the recipient takes action. Use checkboxes to make the benefits absolutely clear. Collect minimal information by way of your lead form. 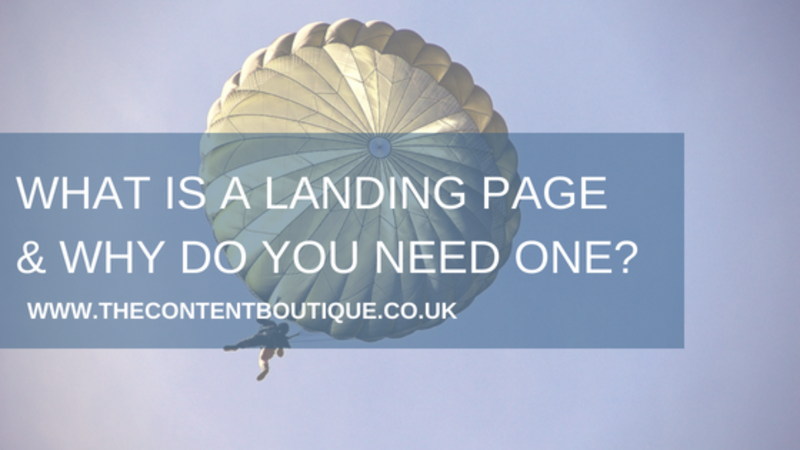 To receive and convert readers into enquiries from a marketing campaign, it makes sense to set up a landing page. If you would like help writing landing page copy, then drop me a line to get information about pricing.